Trim off the stem end of the eggplant. Cut lengthwise into thin slices. Brush with some olive oil and season with salt. Bake at 220°C/430°F for approx. 20 min., flipping the eggplant slices halfway through. Add walnuts to a food processor. Pluck thyme leaves and add to the food processor with maple syrup and honey. Blend until well combined. 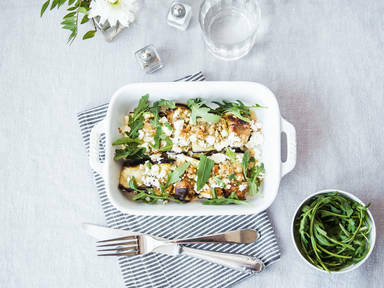 Coat cooked eggplant slices with walnut-thyme paste and place a small spoonful of goat cheese in the center of each slice. Roll up the slices. Grease a baking dish with some olive oil and transfer the eggplant rolls, seam side down, to the baking dish. Top with the remaining goat cheese and walnut-thyme paste. Bake at 220°C/430°F for approx. 10 min. Enjoy!